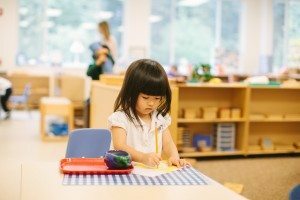 We offer the highest quality individualized Montessori education experience, focused on fostering independence combined with a sense of community and global awareness. We give this to each child from 13 months to 9 years old. We are accredited by the American Montessori Society (AMS) and the Southern Association of Colleges and Schools (SACS). These accreditations are critically important as they confirm having undergone rigorous accreditation processes. Additionally, our school is licensed by Bright from the Start, Georgia’s department of early care and learning. Our commitment to accreditation and licensing assures parents and the community that we are focused on accelerated student achievement, providing a safe and enriching learning environment, and maintaining an efficient and effective operation. At Montessori Academy at Vickery we have educational opportunities for Toddler, (13 months-3years), Primary (3-6 years), Lower Elementary (6-9 years), and Upper Elementary (9-12 years) students. Montessori at Vickery offers opportunities for Toddler (13 months-3 years), Primary (3-6 years), and Lower Elementary (6-9 years) students.